A team of scientists from Helmholtz Zentrum München and the University of Ulm has discovered that the neuronal transport factor Staufen2 scans and binds to its target transcripts in a much more complex manner than previously thought. RNA is transported within highly complex protein-RNA particles whose structure and specificity are still poorly understood. The team's findings, recently published in the journal Nature Communications, opens up new approaches to improve our understanding of the process. Staufen2 is a neuronal RNA-binding protein that plays an important role in the differentiation of neural progenitor cells during neurogenesis. In addition, it is a key factor in the transport of RNA to synapses and is therefore important for synaptic plasticity, the basis of memory and memory formation. The team led by Professor Dr. Dierk Niessing, group leader at the Institute of Structural Biology (STB) of Helmholtz Zentrum München and professor and head of the Institute of Pharmaceutical Biotechnology at the University of Ulm, showed that RNA-binding domains (dsRBDs) 1 and 2 of the mStau2 protein bond to mRNA with the same affinity and kinetics as domains 3 and 4. It was previously thought that the latter were in themselves sufficient for mRNA binding. While RNA recognition by each of these so-called tandem domains is transient, all four RNA-binding domains recognize their target RNA with a high degree of stability. Previous studies had suggested that only two RNA binding domains in Staufen2, namely dsRBD 3 and 4, are responsible for binding. Despite this, until now it proved impossible to reproduce stable binding required for RNA transport in the test tube. "That problem has been solved," says Niessing, "because it is now clear that dsRBDs 1 and 2 are also needed to create a stable complex. Using various biochemical and biophysical techniques, we were able to explain the behavior of dsRBD 1 and 2 ". 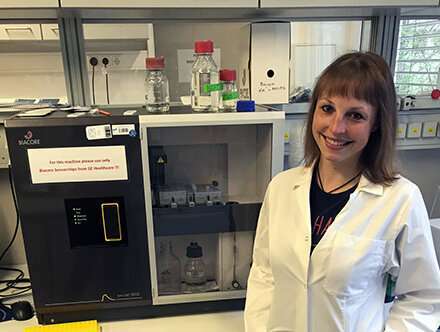 "It turns out that Staufen2 recognizes its target RNAs in a much more complex way than previously thought," adds Dr. Simone Heber, lead author of the article and postdoc at the STB. "Staufen2 scans and binds to its transcripts with four RNA-binding domains in total ". The study was carried out in close collaboration with Professor Michael Sattler, Director of the STB and head of the NMR Center of Helmholtz Zentrum München and the Technical University of Munich, and Dr. Anne Ephrussi, head of the Developmental Biology Unit at the European Molecular Biology Laboratory (EMBL) in Heidelberg. The Staufen2 protein plays a key role in memory formation and memory persistence, though the process is still not well understood. In an aging society, research on this topic is of paramount importance as it improves our understanding of the molecular underpinnings and principles of learning and memory.